Speaking with the candidate in a year of election. 'Bullet The Blue Sky' at the Dreamforce show, live from the Cow Palace. The band opened up with Vertigo, Elevation, I Will Follow and Beautiful Day before a surprise performance of California (There Is No End To Love), a track played in full only a handful of times on the road last year. The rest of the set list went like this: Angel of Harlem, Stuck In A Moment You Can’t Get Out Of, Every Breaking Wave, Bullet The Blue Sky, Pride (In The Name of Love), One, 'Streets', With Or Without You and 'Still Haven’t Found'. 40 closed the night. Let us know how it was in the comments below. Pinch me, was I dreaming? I had the good fortune of working for an awesome company that allowed me to attend the Dreamforce conference in SanFran last year. I had no idea my absolute favorite band of all time was the featured concert! The concert venue was perfect. weather perfect, and I kept asking myself, "Am I dreaming?" The bit about Trump was second to none, who would have known the creep would win?!! I was lucky to be positioned by the catwalk and could see the Edge's shoes, I was so close. It was something to behold. hey U2 ! Don't let us out of the loop !!! Come to Mexico! Spread the love ! Include us in your North America Tour ! Specially now that our neighbor wants to build a wall ! A U2 concert would be great for us ! We love your music, its gives us hope and strength! Start your tour in Mexico city ! Estadio Azteca and millions of fans are waiting for you! one of the reasons because the band is still relevant is that Bono (the bands voice) keeps been critical. I don't think they were long time fans if they didn't know the politics of U2. wouldn't you say? Like it or not, Bono and the band will always go the "speak your conscience" route when something gets them particularly fired up and they won't be frightened by the potential backlash. I think Americans sometimes take offense because they see it as "foreigners" criticizing their policies. But these guys have been dialing up righteous indignation when the situation calls for it for years. There are so many examples of this - from being critical of Ronald Reagan and Oliver North with respect to the Iran-Contra affair, very openly advocating for Arizonans to impeach Gov. Mecham over the MLK holiday issue (Mecham did in fact get impeached), and of course being very outspoken in their opposition to those who would use violence to achieve political ends in Northern Ireland. And all of those references are just from the Joshua Tree tour! Anyway - if you can't take a little righteous indignation from these guys from time to time, remember what Adam Clayton said in Rattle and Hum: "There are people who would say that you shouldn't mix music and politics, or sport and politics, or whatever, but I think that's kinda bulls**t"
I am amazed by the number of "long-time fans" who are now screaming at U2, because they're voicing their opinions about Trump. Wake-up call! U2 has ALWAYS been political. If you're offended by their version of Bullet, don't watch, listen to, or talk about it. I further suggest, you have no clue how to interpret what their lyrics mean. If you didn't take the time to do so, it's my opinion you are not a true fan. Now, more about Trump. As a WOMAN who has a DAUGHTER, I fear how far back he will set a female's rights, especially for my daughter's generation. He's a misogynistic, self-serving, crooked, racist, EXTREMELY dangerous hot-head who will start WWIII. He never answers questions, he dances around them, insults others to throw attention off himself, has more to say about how the other's plans are non-existent, all-the-while never giving straight, consistent answers. He's often on video saying or doing things he later says he didn't do or say. He's a salesman, people!! In political terms, I believe that there is a difference between a band of convictions and a fanatical band. Just as there is a difference between a person's beliefs and a fanatical person. The fanatic bribe, seduce, corrupts and removes the freedom of choice of your audience. It is the use of the most autocratic possible political term. A person's beliefs invites people to think and use the political term of inquiry and freedom of thought. 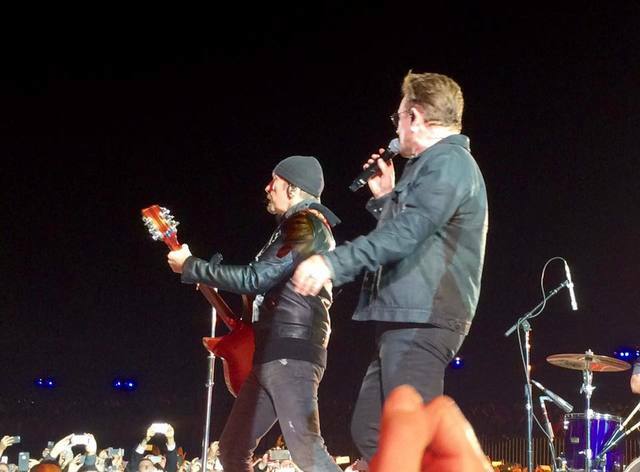 U2 has always operated with political convictions and was always allied to freedom of thought. As avid fan, I do not remember the band require people to hold the same beliefs. But I remember that they often invite the public to reflect on many controversial issues. And it has always been since the early days of the band. This freedom of thought is fundamental. For the audience and the band, there is no absolute truth. It's important to denote that in "absolute truths" live monsters of reason that corrupt, recruit and remove you freedom. To be a conviction one is necessary more corauge and gift. This is why we love U2, they have a conscience like John Lennon. Trumpilstilskin, the Great White Dope will lose and go back to being a hate mongering bigot. Those who stay silent are appeasers. Like Pete Seeger asked, "Which side are you on?" Bullet the land of the Free? In the year of election … The stories from 1987 of tearing down the walls that hold us inside, not having found what was being looked for, the stinging rain driving nails into the souls & sea of pain and the “Hope and Faith” of Liberty never seemed more poignant??? Trump's rich comments are taken out of context. He was replying to those that said he wasn't worth the millions he has made. He does bring much of this ire on himself by not being politically correct but for U2 to take his comments out of context is disingenuous. Bono, you might love the idea of America but I actually live here full-time near the Mexican border. Let me take you on a 2 hour car ride around to see what's going on here and then you can tell me we don't need a wall. U2 has been envolved in many subjects for long time (policy, human rights, global economy, wars) and in that case with more reason. Because "the candidate" is a crazy dangerous man. And If he use the mass media to lie people, a public person has to announce that. And Bono is that person. Is there anything wrong on that? I agree U2 always had their statetments during concerts and that is fine. That is U2. I personnally prefered the Achtung Baby years and the ZooTV tours when the statements were there but not so much "in your face" (like the burning crosses that turned into burning Swastikas during Bullet the blue Sky for instance). Everybody got the message without the 10 minutes preaching by Bono. Less is more sometimes and this version of Bullet the Blue Sky is definitely way to much in my opinion and I don't think it actually makes people change their minds on who to vote for. Guys I was not there but please put the whole performance of Bullet out there. In my opinion one of the most powerful versions ever. They've been political since day one. If you all of a sudden have a problem with it now, then something has changed in YOU. They aren't any different than they've always been. They have always focused on American politics (it makes a difference to the rest of the world, too). If you disagree because you like Trump, that's ok. They're still the same band you grew up with. The election is almost over, but it effects all forms of art while it's happening. Deal with it. There is no reason this band ot any band should be told to "shut up and sing" Anyone telling them that is no true fan of this band. They have always made powerful political statements about causes they believe in both is their music and at concerts which I have been attending since the late 80's. Now because its related to America you want them to shut up? Keep it up guys your true fans supporting your right to freedom of expression political or no. 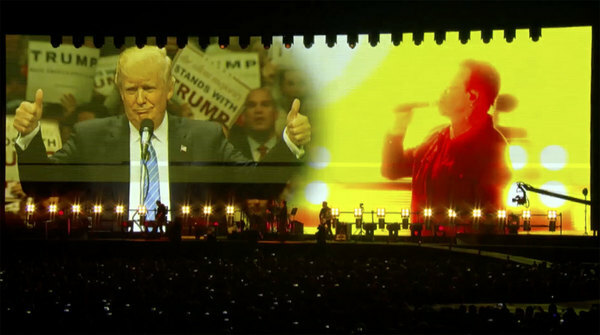 I was at this show and it was absolutely great, as all U2 shows are, and I think overall the crowd loved Bono's attack on Trump. (Except for the few Trump fans that may have been there.) But as many of you have said, U2 has always been a political band and I love them for it. Whoever leads the USA is in an extremely powerful position and will have a lasting affect on the world at large, so it's a world problem if Trump is elected, who wants that hothead with his finger on the button? Thank you Bono, for speaking your mind, promoting peace and civility, and making me gloriously happy with the music of U2. Usually, I would disagree with U2 getting involved with American Politics but Trump is so dangerous that I am on board with this version of BTBS. He has to be stopped...you don't want this Clown anywhere near the Nuclear codes. By the way, not a fan of Hilary either but I will be voting for her. While I was not at this show, I have attended every U2 tour since 1980. I am shocked to read these comments telling U2 to stick to music. They have always been about so much more than music, they would not BE U2 is they "stuck to music". I remember several Rock The Vote tours, tours where Amnesty International was exposed to the audience, tours where entire concept of ONE organization were given birth. People who are asking just for music are neither true U2 fans nor are they representative of the millions of fans U2 has won and retained over the last 40 years. Keep on Rockin' in the Free World boys!! I do not understand the argument that Bono should just "shut up and sing" and not express his political beliefs. Why can't a rock star use their forum to express their feelings about politics or anything else that impacts the world? Why does it have to be one or the other? U2's music often includes messages about the world: Sunday, Bloody Sunday, Pride, Exit to name a few. Without question, these songs express their political beliefs. So if they can express their beliefs in their music, why can't they do it during a show? For all the talk I hear about adhering to the Constitution, shouldn't we be adhering to the 1st amendment for all, including our rock stars? Trump is not worrisome, because Trump did not win the election; but the worrying thing is the people who follow. This is the real U2! I find it interesting to note the comments of some unbelieving fans who prefer the band remained outside the theme of the American elections. Interestingly, it is still difficult to accept that US presidential elections are crucial to the balance of power in the world. These reactions make me remember an old quote from Adam Clayton of which I agree entirely: "There are people who would say that you should not mix music and politics, or sport and politics, or whatever, but I think that's kinda bulls * * t. "
... there are U2-Fans in this world, who don't support this. If you don't, you don't understand what U2's all about. It's as simple as that. Well said. America is already great - Trump mustn't be allowed to make America grate. Love Bono and the boys of U2 but let's call a spade a spade.... you're Irishmen... not American. You may live here, but our politics are our politics. You cannot speak for the American people. The American people will speak for ourselves. That is what your message is, isn't it??? that we all have our own voice? and yet you're forcing your opinion on us after we pay hundreds of dollars for tickets? I love your music and have been a fan for so many years, but the political stuff doesn't change my mind... in fact it makes me want to vote for Trump even more. Get real. They've (particularly Bono) *always* been "political" by which they mean speaking out against injustice and oppression. As a long-time U2 fan I wouldn't want it any other way. I don't care whether I agree with them or not, I love the fact that they want to do more than rake in the $$.